My last post was August 23rd. It has been over a month and a half since I’ve written, not that I have not tried. There are two draft posts sitting in the queue waiting for me to conjure the determination to finish them. Though, the chances of that I must admit are rather small. It seems that just as life gets exciting I lose the determination to write it down. I really ought to finish the story of our trip to Salalah. Since Salalah Lisa and I spent a week in Hong Kong the kids have started school and I just competed in my first triathlon a few days ago. Life here in the UAE is taking on a familiarity kin to home and while that is allowing us to stretch out and feel more comfortable it is eating away at the defences that keep us from complacency and too much ease. The last year I believe has helped us grow closer as a family than any year previous. We have had to rely on each other in a strange land. My kids will probably grow up and find someplace to settle down never to leave it again. Last night Kirsten was telling me how she wanted nothing more than a log home on a lake with a couple horses. I challenged her to think about what she might need to do to make that dream a reality – that was not an easy conversation. As always I think she took it as me punching holes in her dreams. Of course that could not be farther from my intent. I’ve learned that dreams rarely become reality when they are not sought after, struggled for and pursued. We all need plans and the capacity to alter them when we must and a thorough enough understanding of the course ahead to avoid those alterations where possible. 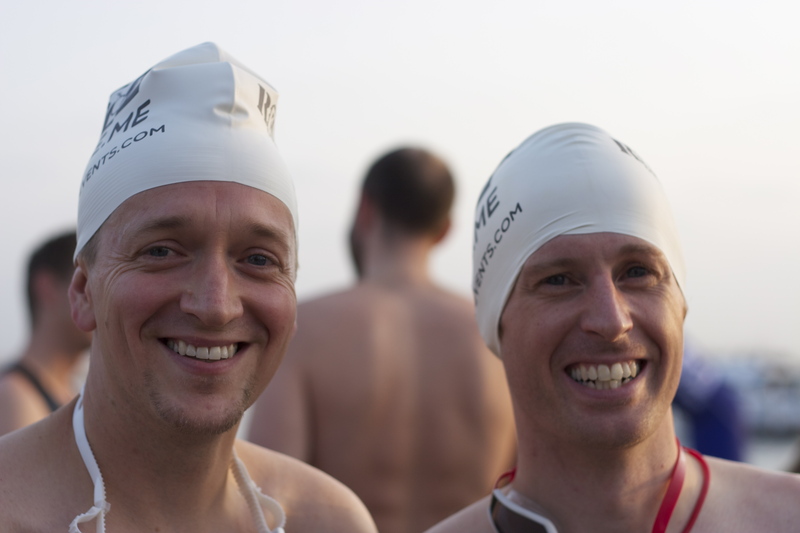 Jeremy and James ready for the 750m swim. My first triathlon was more difficult than I anticipated. It was only a sprint triathlon but that was far enough. The course included a 750 meter swim, 21.5 kilometre cycle and a 4.6 kilometre run. At the start of the race I lined up with my competitors on the beach waiting for the signal to enter the water. Swimming is probably my worst event and I should have known that I did not belong at the front of the pack. The guy next to me was psyching himself up breathing deeply and bouncing in anticipation. He looked bent on murdering that course. The signal was given and 150 men and women exploded into the water. It was a wreathing mass of arms and legs. I could feel my competitors slide past me brushing my sides and slapping my feet as they surged to overtake me. Soon they were swimming full over me pushing me beneath the warm waters of the bay. A few times I took massive swallows of the salty water before I could carve out a space for myself. Two thirds of the racers would pass me by. We made two laps of a triangular course. I had long ago given up the front crawl and resorted to a breast stroke when I saw the second wave of competitors enter the water. The rhythmic slap of a hand against my foot forced me to push harder determined to give no more ground as the final lap neared the end. I was pleased to leave the water but was concerned about my time. It turned out that I was 30 seconds faster than I’d predicted, emerging after approximately 17 and a half minutes. I wondered about my friend Jeremy who was racing with me. Was he at his bike already? I was glad to see it still there when I pulled into the transition. I worked frantically to prepare myself for the cycle. Jeremy would arrive before I left the transition. I was not far ahead. I lost one of my water bottles when I entered the course. As I crossed a speed bump I heard the bottle strike the ground and then saw it roll away. I would not stop for it. Biking is not my favourite event. I don’t even own my own bike. Some friends have lent me a bike for the past few months. It was collecting dust in their home with a flat tire. Unfortunately the frame is much too large for me. With the seat as low as it can go I can just make it work. I was awed by the intricately engineered master pieces that glided by me again and again, both man and machine. Lithe and tuned machinery was matched by sinuous and practiced bodies. The course was a mind numbing 4 laps of a nearly flat out and back road. It was difficult to keep the correct number of laps in my head (is that 2 laps or three I just did). As I transitioned from bike to run I moved into my element. The sun was up now, however, and the temperature rising fast. I finished off what was left of my remaining water bottle ignored my gel pack and stretched into the run. I’d practiced this and knew what that bike to run transition could feel like, frankly terrible. My practice had paid off though, I felt hardly any disadvantage as I moved into the run. It was my turn to glide past my competitors. As I approached the first aid station I wanted to drink the entire table of water. I settled for a sloshing glass as I ran past; the majority of its precious contents watering the pavement. A stitch formed in my chest. Its been a long while since I’ve felt one of those. I compensated by drawing deeper breaths, the pressure of my full lungs easing some of the pain. I ignored the pain and pulled a little harder. I made the second u-turn and felt great except for that annoying stitch. As I approached the half-way mark a race marshal pointed me left but within a few moments I was feet from the finish line. This can’t be right! I turned around “where do I go?” It was chaos. The marshals now pointed me right and I fell in behind the racers I’d been stocking the last couple minutes. Those following me breathed their frustration as we altered course and returned to the track. One more lap. Again the aid station was looming before me and I slowed even more this time determined to get the majority of that water into my system. It was nearly over. No one had passed me on the run so far. I made my final u-turn and opened up. One, two, three, four I glided by others. A few minutes more and there was the finish line. The announcer called “Here comes number 15 and he’s flying.” I poured myself out into those last few meters until there was nothing left. They really needed a longer breakaway after the finish line it was hard to stop. A volunteer took my timing chip and I made my way to the aid station and water. I’d had three cups of water before I was approached by a race volunteer. “You missed the third u-turn, you know?” What! She explained that there was this awkward dog-leg to the course right by the finish line (that place of chaos) that I was supposed to run. I was defeated, how could I have worked so hard just to mess it all up. The dog-leg was a mere 25 meters one way (I was supposed to do it twice – I shaved 100 meters from the course). I had no one to blame but myself. Yes, it was a poorly designed piece of the course. Yes, it should have been better marked. Yes, I clearly was not the only one who missed it (likely the reason I was not disqualified for the oversight). In the end though I did not study the map well enough but relied on the runners ahead of me and the well intentioned marshals on the course. In that moment when I was told I’d missed the turn I was defeated, crushed. Joseph once said that “hell is the torment of disappointment” and in that moment I fully resided there. I returned again and again to the aid station. I could not get enough water. I tried cheering Jeremy through the finish line but I’m afraid I was not really present. We skipped the awards and breakfast and headed for home. I was feeling off. At home I crawled into bed – I was freezing. It was the flu or dehydration I couldn’t be sure. Several hours of fitful rest took me through hot and cold flashes. It was only sheer mental determination that kept me from throwing up in bed. My back was out too. I could not move without the feeling that something might break. It had to be dehydration. By the evening I was nearly 100% again. Rest and electrolyte replacement did the trick. In the end I was not disqualified but I’ll always know my time is just a bit off. I had the fastest run of all the novices even when calculating for the missed section of course. Yet that little victory is tainted by the memory of disappointment (I’m sure it will fade). So Kirsten when I ask you how you plan to reach your dreams I just want you to study the course so that even if they don’t work out the way you envision you’ll know that you did your best. In the end its not the obtaining of the dream that really matters but the pursuit of it. You’ll have race marshals on the ground directing you, peers that you will follow and certainly peers following you too. Your peers and the marshals directing the way aren’t perfect they may steer you poorly so don’t rely on them fully. Study the course so you can be confident in your decisions. It is fine to stay the course but no matter the temerity of spirit or determination of soul it will prove futile if you do not first know the course you pursue.